What is the difference between the Lhasa Apso and the Tibetan spaniel dog? Lhasa Apso's have much longer, silkier hair coats. They are shown in AKC conformation classes in a much frillier style than Tibetan Spaniels. Tibetan Spaniels are not to be trimmed or groomed in any unnatural way for the show ring, and are more utilitarian dogs than Lhasa Apsos. Lhasa Apsos are more readily available in the United States and are much more common as pets than Tibetan Spaniels. Both breeds of dogs are supposed to have friendly personalities, and both bark at strangers. Due to their longer hair coat, the Lhasa Apso tends to have more problems with their eyes due to hair constantly rubbing them. It is advised that Lhasa Apso owners trim this hair back frequently to prevent this problem. Both breeds have a natural tendency to have dental disease at an early age, so daily tooth brushing is recommended. Being small breeds, both tend to be bossy over their owners and other pets, so obedience and puppy classes are always beneficial. Both breeds tend to become overweight easily, so a good diet and plenty of exercise is important. Being small dogs, however, they both make good apartment dogs and need less exercise than large breed dogs. Due to their rarity in the United States, expect to pay a much higher price for a Tibetan Spaniel puppy than for a Lhasa Apso. Typically pet quality Lhasa Apsos sell for around four hundred dollars, while a Tibetan Spaniel puppy can set you back a thousand dollars. 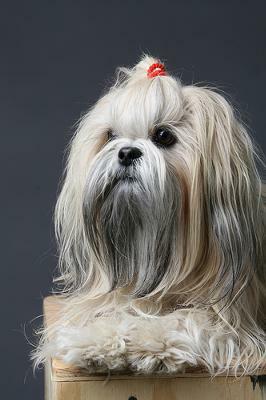 You can find either breed through rescues like Petfinder.com, but due to their popularity, you will find many more Lhasa Apsos that way than Tibetan Spaniels. Join in and write your own page! It's easy to do. How? Simply click here to return to Tibetan Dog.